The use of real pictures of real famous people helps to inform the reader that these are not hypotheticals. It’s not theoretical that girls can like cars. Danica Patrick loves cars and she’s a real person. The text is simple and playful, and the pictures do most of the talking. Since most of the pictures feature real people, as kids grow older you can discuss the person in the picture – what they do and why they are famous. And as kids get even older you can discuss discrimination that someone like Danica Patrick might face in her job. My only complaint about this book is that the names of the people in the pictures are not included so if you don’t recognize them, you won’t be able to find out more about them. I definitely recommend this book for parents of boys and girls. Amazon (affiliate link) recommends this book for ages 2-5, and I think that is right. Start the message at home as soon as the message starts at school. 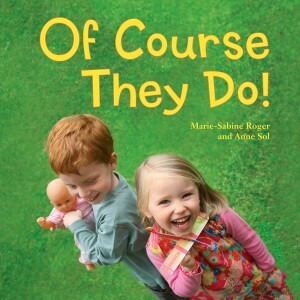 I love the sound of this book and will definitely keep it in mind for future gifts for my youngest friends. 🙂 I too am surprised how early the gender stereotyping begins, and I think the use of real life examples of amazing women and men are a great counterbalance. Thanks for your review, Jennifer, and thanks to Charlesbridge Publishing for publishing such a great book!